JANUARY 2019 I FLEX007 MAGAZINE 51 In a multilayer construction, it is highly recommended to use only adhesiveless flex laminates. The designer also needs to define the type and nature of the copper weight to be used. Normally the copper for flex is a foil that is rolled and annealed; however, some of the thinner copper weights (sub-1/2 ounce) are typically only available in electrodeposited copper and not recommended in a dynamic design. It is also important to specify the nature and type of coverlayer material and stiffeners to be used. In short, specify any material that is to be used in the construction and stay with the final part must be identified. Hole Pattern with Sizes and Plating Requirements Holes are not always required for flex cir- cuits, but they are usually required for vias or for making connections to leaded components or connectors. Thus, documentation must specify the size, number, and location of any holes required for the circuit design (Figure 1). This data is easily extracted from digital design files and will be critical to the vendor to deter- mine the cost of the manufactured circuit. Conductor Layer Count The majority of flexible designs have only a single metal layer, but a substantial number of flex circuits feature two metal layers. 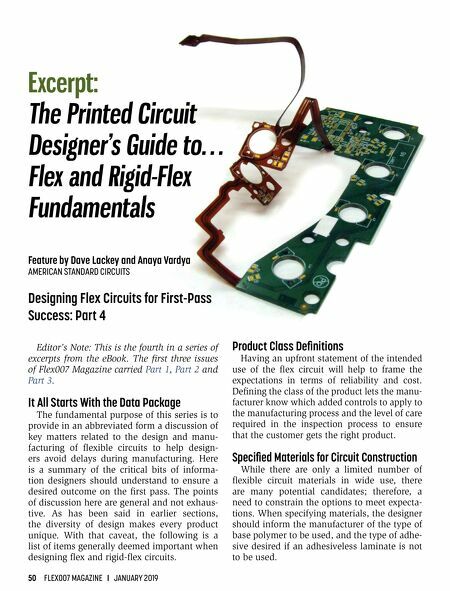 Multi- layer and rigid-flex circuits are less common, and there is a need to provide layer counts for the circuit design. Layer count is perhaps the most obvious indicator of overall circuit com- plexity and is important for quoting and pro- duction planning purposes. Circuit Design Artwork Proofing circuit artwork and checking the design against various design rule require- ments and objectives (e.g., design for manu- facture, design for reliability, etc.) are impor- tant and necessary conditions for release to manufacturing. Ideally, the information is sup- plied in a digital form in one of the major CAD formats. The best format is ODB++. The CAD information provides a definition of what the circuit will look like, where terminations will be located, and how they will be shaped. It is also important in case the design needs to be modified or adjusted by the flex manufac- turer to compensate for processing. The final design contains information needed to provide an accurate and realistic quote. Cross-sectional View of Circuit Construction A cross-sectional or side view of the finished circuit provides the manufacturer with a scaled view of construction materials. 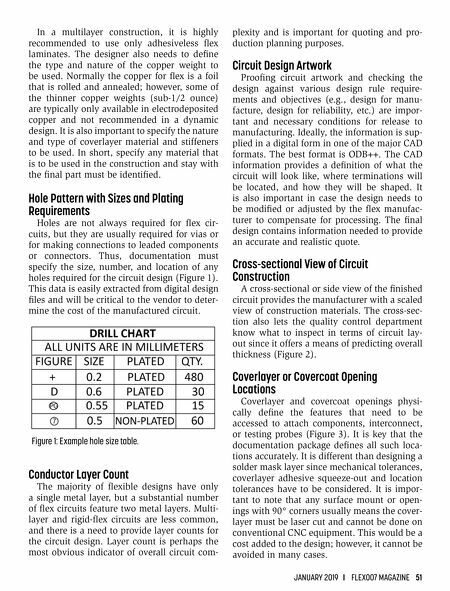 The cross-sec- tion also lets the quality control department know what to inspect in terms of circuit lay- out since it offers a means of predicting overall thickness (Figure 2). Coverlayer or Covercoat Opening Locations Coverlayer and covercoat openings physi- cally define the features that need to be accessed to attach components, interconnect, or testing probes (Figure 3). It is key that the documentation package defines all such loca- tions accurately. It is different than designing a solder mask layer since mechanical tolerances, coverlayer adhesive squeeze-out and location tolerances have to be considered. It is impor- tant to note that any surface mount or open- ings with 90° corners usually means the cover- layer must be laser cut and cannot be done on conventional CNC equipment. This would be a cost added to the design; however, it cannot be avoided in many cases. Figure 1: Example hole size table.